Take all your Cataclysm builds and chuck ’em. They’are all dead and useless. 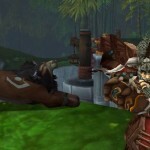 Mists of Pandaria is revising everything. 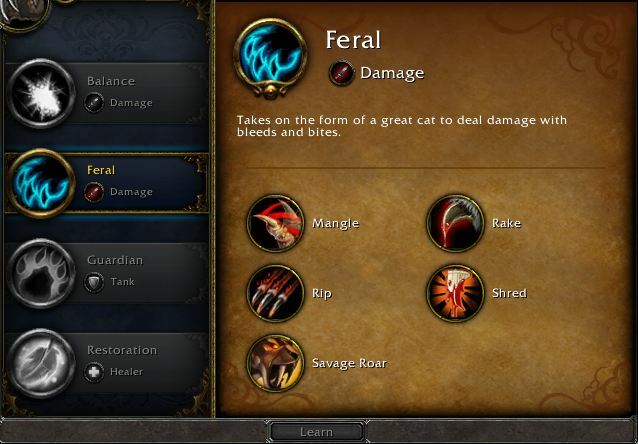 All classes will share a pool of abilities, as they always have, but each spec in each class will have a set of unique abilities that define that spec. These abilities will be learned from your trainer, as you level, just like any others. By the way. 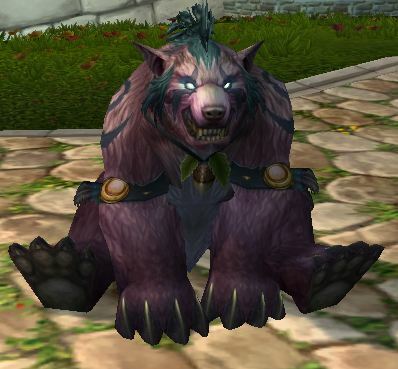 Druids will have four specs in Mists of Pandaria. In reality, they always have, now it’s just official. Note – this page is a work in progress. If you find something wrong, leave a comment. 7/26: Added a video on the Druid ability Symbiosis. 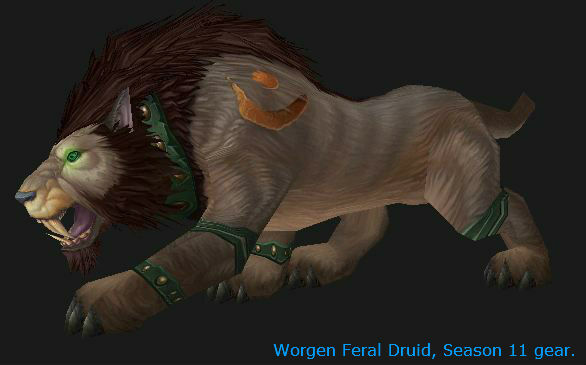 This one ability make make Druids the essential class in raids and maybe PvP. 12/13: Corrected the abilities table. The talent system from Cataclysm is gone, as mentioned above. Many of the old talents (and some glyphs) have been rolled into abilities learned from your trainer. Many others have been ganked outright. Talents are now available to any spec. You have six tiers of talents, learned at levels 15, 30, 45, 60, 75, and 90. Each tier has three talents and any spec can pick any one talent from each tier. Glyphs (for all classes) are changed. Prime glyphs are dead. Many individual glyphs have either been slain or have been changed in some way. primes and Majors have, more or less, been merged. Minors are similar to what they were before. You will have six glyphs at level 90, three major, three minor. Battle Pet Training is a new ability, for all classes, that you get from your trainer. There are a few new abilities, in the table below, and check out what Symbiosis will do. This is the new talent page, many of the old talents have been rolled into abilities that you will get from your trainer. Hover over the links for more info. Any Druid spec can pick any one talent from any row. You will have six total talents at level 90. Notes that there are no points to be spent in any talent, you will get the whole thing when you make your pick. Level 15 Feline Swiftness – 15% movement speed bonus. Displacer Beast – Activates Cat form and Prowl and teleports you up to 20 meters forward. Wild Charge – Fly to a neaby Ally’s position. Level 30 Nature’s Swiftness – When activated various spells become instant, free, and castable in all forms. The healing and duration of the spell is increased by 50%. Renewal – Instantly heals the Druid. Useable in all shapeshift forms. Cenarion Ward – Protects a friendly target, causing any damage taken to heal the target every 2 sec for 6 sec. Gaining the healing effect consumes the Cenarion Ward. Useable in all shapeshift forms. Level 45 Faerie Swarm – Causes 3 applications of the Weakened Armor debuff and reduces the target’s movement speed by 50% for 15 sec. While affected, the target cannot stealth or turn invisible. Mass Entanglement – Roots your target in place and spreads to additional nearby enemies. Affects 5 total targets. Useable in all shapeshift forms. Typhoon – Summons a Typhoon that strikes targets in front of the caster, knocking them back and dazing them for 6 sec. Useable in all shapeshift forms. Level 60 Soul of the Forest – Aessina’s blessing grants a benefit which varies by your combat specialization. Incarnation – Grants a superior shapeshifting form appropriate to your specialization. You may freely shapeshift in and out of this form for the duration of Incarnation. Force of Nature – Summons treants who’s abilities vary with your spec. Level 75 Disorienting Roar – Invokes the spirit of Ursol to roar, disorienting all nearby enemies. Any damage caused will remove the effect. Useable in all shapeshift forms. Ursol’s Vortex – Conjures a vortex of wind at the destination location that reduces the movement speed of all nearby enemies. Useable in all shapeshift forms. Mighty Bash – Invokes the spirit of Ursoc to stun the target. Useable in all shapeshift forms. Level 90 Heart of the Wild – Increases Stamina, Agility, and Intellect by 6% at all times. When activated, dramatically improves the Druid’s ability to perform roles outside of their normal specialization. Dream of Cenarius – Wrath, Starfire, Starsurge, and melee abilities increase healing done by your next healing spell by 30%. Tranquility is not affected. Nature’s Vigil – Increases all damage and healing for a short time. While active, all single-target healing spells also damage a nearby enemy target for some of the healing done, and all single-target damage spells and abilities also heal a nearby friendly target for some of the damage done. 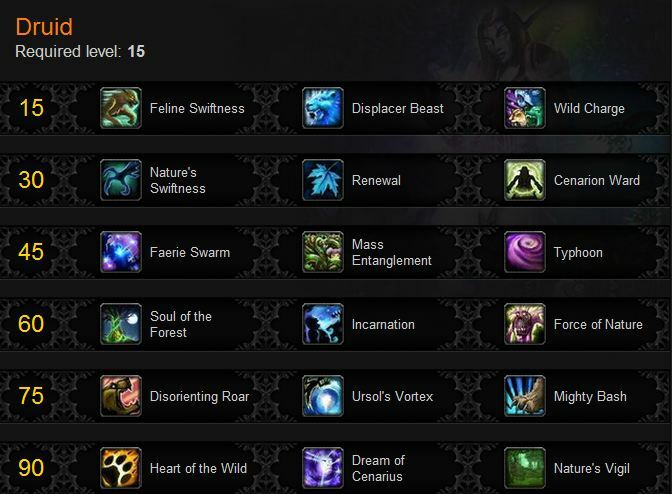 This is the list of general abilities for Druids, all specs get all of these. See below for abilities unique to each spec. There have been a few changes and a couple of new abilities. Some of the abilities have had their level requirements changed and I’m not certain how correct these are. (WoWhead’s databases disagree.) I’ll update when possible. 1 Glyph of Rejuvenation Probably an error? This shows as an ability AND a glyph. 1 Treant Form Was a glyph. 1 Wrath More damage than before. 10 Clearcasting Was a talent effect. 44 Astral Storm New – Creates a violent magical storm in the target area causing Arcane damage to enemies every 1 sec, and increasing the time between attacks of enemies. 44 Hurricane Duplicates Astral Storm? 54 Innervate Was level 28. 56 Rebirth Was level 20. 87 Symbiosis New – Copies an ability and grants one. As mentioned above, you now have the four specs. Dual builds are still available, so you can still pick two. The old Feral tree and been split into Feral (Cat) and Guardian (Bear.) Each spec will now have a set of abilities, not talents, unique to that spec. Points are not spent in any ability, you will get the whole thing when you get it, and they are all learned from your trainer. Restoration – Everyone’s favorite healing tree to hug. These are in addition to the abilities listed above. Notice that some of these used to be talents. All of these are picked up from your trainer at the appropriate level. Some are dead, some are abilities, some have been rolled into other things. I probably missed a few, leave a comment if you see a problem. 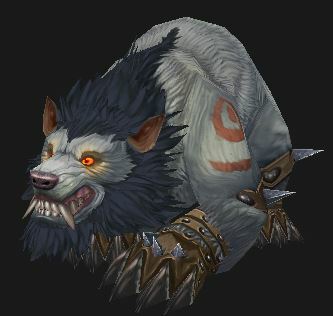 In a nutshell – The druid can both give an ability to another character (for an hour) and borrow one at the same time. Druid an player need to remain reasonably close to each other, 30 yards. The spell you receive isn’t quite as nice as the original, but is still useful. No one loses a spell, but the recipient gains it for an hour. Keep in mind that the M of P launch is two months away as I write this, so this ability may change. Given how overpowered it might be right now, change might be very likely. This table lists all of the abilities gained by Druid and Recipient.